Tacos are loved and tacos are FUN! Messy, unruly, and unrefined, tacos make perfect weekend food, street food, and party food. They are rebellious and lawless, allowing us to define anything as a taco from the super healthy to the more decadent. As a vegan, I have found mushroom, cauliflower, and even brussel sprout tacos at restaurants in NYC. Today, I'll share with you a taco featuring another plant-based power food, tempeh. Tempeh is soybeans, cultured and fermented, using a natural process to make a cake-like patty. It is a very digestible (because of the fermentation), satisfying, and malleable food that can be transformed by many different flavor strategies. As we move into fall, I have been craving more comforting, warm foods at dinner, and I am cooking more with spices like turmeric, cayenne pepper, cinnamon, and ginger. Although I eat starchy vegetables and grains foods year-round for good health, I crave them even more in the fall. Searching the app, Yummly, which has smart filters to allow you to search for vegan and gluten-free recipes, I felt lucky to find a really great vegan taco recipe from the blog Fresh Off the Grid. Below is my version using a few substitutions. 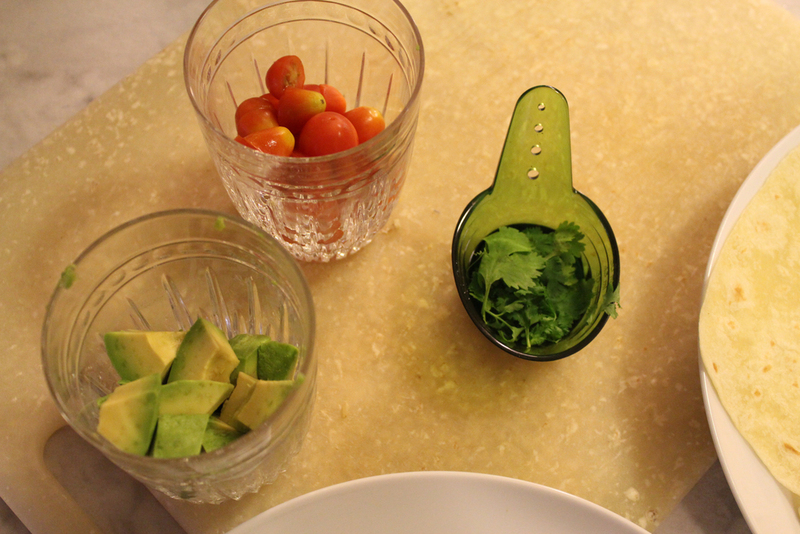 Chopped avocado, cilantro, organic salsa, limes, chopped tomatoes as toppings! For the taco seasoning, I used Trader Joe's brand. As purple onions are my favorite, that's what I used here. The tempeh I found at Trader Joe's. Their brand is not gluten-free, but works for me since I do not have celiacs disease and can eat low amounts of gluten when paired with fibrous vegetables to aid digestion. I also like to buy the Lightlife brand of Tempeh when I'm not shopping at a Trader Joe's. Begin by chopping the onion -- be careful of your little fingers and don't touch your eyes! Bring the water, taco seasoning, and onion to a boil. Next chop up the full packet of tempeh, add to cooking pot, and reduce heat to low. Allow the tempeh to absorb the liquid, and then add the drained black beans. Cover and cook on low heat and stir often. While you wait, start to heat up the tortillas. As I do not cook with oil, I either put them in a 250 degree oven on a cookie sheet, or warm them on low in a pan on the stovetop using apple cider vinegar to provide some moisture. I love the taste of using the apple cider vinegar! Take care to not use too much or the shell becomes wet and falls apart. Keep care of your mixture in the pot so that the bottom does not burn. Add in a pinch of sea salt. Dish out tempeh and bean mixture and top with your favorite plant-based taco-appropriate foods like avocado, cilantro, organic salsa, fresh lime juice, and tomatoes. I was clearly shopping at Trader Joe's! Here is what I gathered to get a start on taco night. 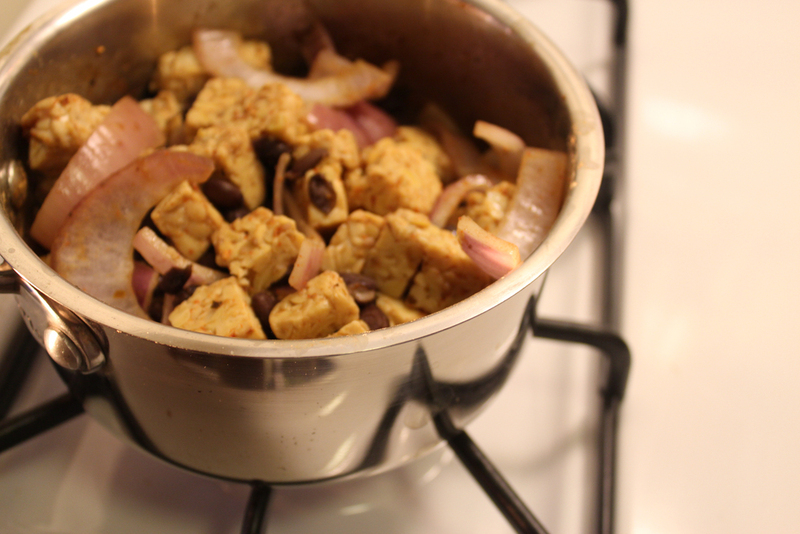 Here you can see the chopped tempeh and onions and rinsed black beans ready to go. My cooking pot after adding the raw tempeh. Once heated a lovely smell will release into the kitchen. Avocados, tomatoes, and cilantro pulled through this green herb kitchen tool, added a lot of fun to my taco mix. Now cooked, you can see how gooey and delicious the mix becomes, which makes it perfect for sticking inside the tortilla. Complete, beautiful, and so good, my tacos are set out over gluten-free corn tortillas. Scott's tacos, in non gluten-free wraps, also look amazing. What are your thoughts about tacos? Do you love them too? What are your favorite plant-based taco fillers? Let us know all about your taco adventures in the comment area below, or on Twitter or Instagram @forkfuloflove. Please use #theforkfulway to show us anything you are eating inspired by the Forkful of Love blog. We'd love to see pictures of you and your plant-based tacos, which we will be sure to RT!